100x Better Than Chinese Takeout – We Were Blown Away By This Slow Cooker Cashew Chicken!! Chinese takeout is one of those things that’s become a tradition for us. At least once a week, there’s a night when we just don’t want to do anything, when we just want to sit back and relax with something delicious that we’ve known and loved for years. 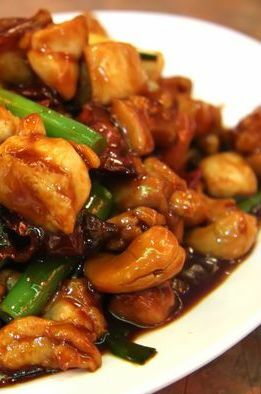 On those nights, cashew chicken is our go-to. Thinking takeout was the only way we could get our tasty favorite, we were floored when we heard we could make something even better in the slow cooker and completely blown away when we tried it and found out that it tasted amazing! You get the same browned and crispy chicken (from cooking it before throwing it in the slow cooker) and then the sauce gets nice and thick with the addition of the cornstarch…we couldn’t believe it, but after trying it several more times we actually like our version way more than takeout!! Place cornstarch (and salt and pepper) in a large, resealable plastic bag and add chicken cubes. Seal bag and shake vigorously so chicken is coated thoroughly in cornstarch. Heat olive oil in a large pan or skillet over medium-high heat and cook chicken for 2-3 minutes, per side, or until browned, then transfer to slow cooker and add bok choy (and peppers, if using). In a bowl, whisk together soy sauce, garlic, hoisin sauce, rice wine vinegar, brown sugar, ketchup, chili sauce, sesame oil and ginger together until combined. Drizzle sauce over the chicken and bok choy and toss together to combine. Cover slow cooker and cook on LOW for 3-4 hours. Add cashews during the last 30 minutes of cooking or right before serving. Note: or HIGH for 1 1/2-2 hours. Transfer to plates and serve hot with rice or noodles. Enjoy!